UK network Three have just announced an idea to help train customers on the digital world. It’ll help them keep connected and up to date. “Discovery” by Three gives people a chance to learn about social media, online shopping, backups and much more. Plus with 21% of the population lacking basic digital skills according to their research, Three hope this will get everyone using their phones more without fear of the unknown. Originally launched in just two stores, this idea is now rolling out to every Three store in the country so everyone can take advantage. Check out the full press release below for more information on how to take part. July 17, 2018: Three UK today announces that it has trained all of its 2,800 UK in-store retail staff to deliver bespoke digital training sessions that can be requested by anyone, no matter what network they belong to. Originally launched in 2014 in just two stores, the rollout marks the evolution of Three’s ‘Discovery’ sessions and underlines Three’s commitment to help individuals, community groups and small businesses, make the most of digital and mobile technology through free training sessions and workshops. Aiming to empower and educate people of all ages and abilities to develop their digital and business skills, the new nationwide service is designed to help consumers get the most out of tech and the resources available – from mobile phones and iPads, to social media platforms and business applications. A recent survey by Lloyds found that 21% of the UK population lack basic digital skills, with four barriers preventing consumers from getting online – including access, skills, confidence and motivation. 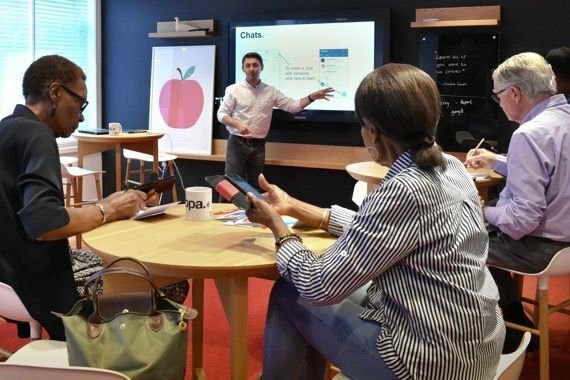 Helping to alleviate the nations tech woes, Discovery aims to address these core barriers and provide an opportunity to tackle the problem, with a nationwide service across 324 of its retail stores, giving access to advice and learning wherever you are in the country. With more than 40 curated sessions tailored to all levels, Discovery gives anyone the opportunity to delve into digital – and all at no cost! With larger sessions covering a range of different topics from online shopping, social media and cyber security the training aims to equip consumers with vital day-to-day digital skills to make the most of their mobile device. Offered to anyone in the local community, from schools, community groups, small businesses, or even individuals that do not understand something specific like storing photos and documents to the cloud – Customers can book in for as little as a twenty-minute session. It can even be completed during a lunchbreak! Paula Cave, director of retail at Three UK, commented: “We believe that digital skills are vital for making the most of everyday life. It generates innovation, opportunity, and even new work or career possibilities for some. We’ve found that it can also enhance personal skills and interests, enabling them to learn or communicate with the people that matter. Helping more than 60,000 people to date, with ages ranging from four to 95, Three’s goal to raise awareness and continue to assist in developing digital skills across the country is now becoming a reality. To book a free Discovery session for yourself or a group, please contact discovery@three.co.uk or visit your local store for more information. Go on. You need a bigger one.